You and your children will be looked after at Riverstone Family Dental. Anxious kids are put at ease using toys, an overhead television screen with kids programs and Tell-Show-Do techniques. Our team will do our best to relax your kids and make their dental experience as fun as possible. 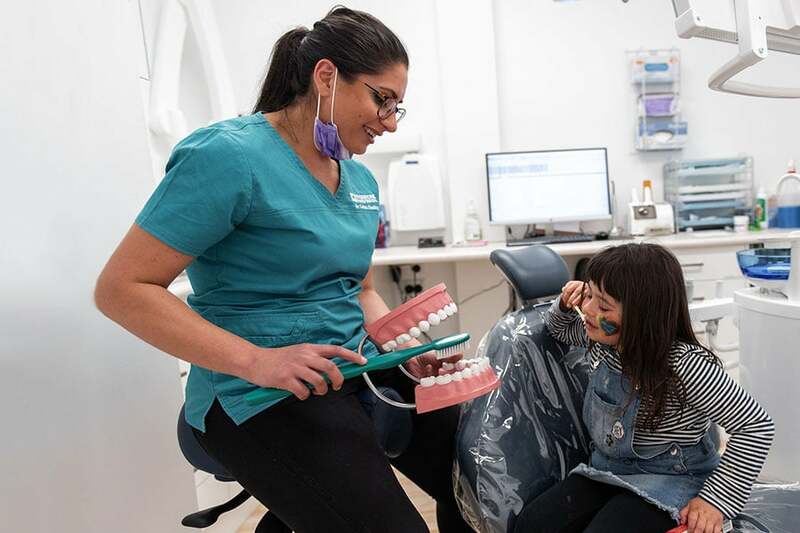 Research shows kids who have positive dental experiences are more likely to look after their oral health and visit the dentist later on in life. Bad Habits – these include thumbsucking or dummy sucking, poor dietary habits which can cause cavities and toothache, pen biting, mouthbreathing, snoring and grinding teeth at night. Tooth and Jaw Development – we will check for crowding, missing or crooked teeth – detecting problems early means kids may only need minor treatment rather than having teeth pulled out or braces. Another issue is tongue ties – sometimes missed at an early age. We check to make sure there isn’t one because if the position of the tongue is restricted, kids cannot talk and eat properly and their jaws don’t develop properly around the tongue. Mouthguards The gold standard for protecting teeth during contact sports. We take molds of the teeth to create a custom-made mouthguard for you. See our Mouthguard page. 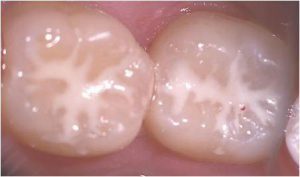 Fissure Sealants These are plastic coatings on the biting surfaces of back teeth. The teeth are coated with a protective barrier so food doesn’t get stuck in the deep grooves and decay can then be prevented.